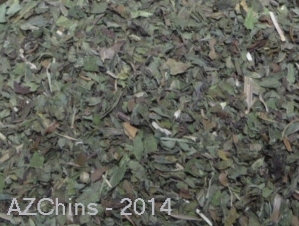 Description: Dried Organic Peppermint Leaf, crushed and sifted. Can be beneficial to chins with digestive issues and upset. Helps to soothe the stomach and intestinal tract, also may have a calming effect on chinnies. We use this with chins that have sensitive tummies and have been on antibiotics. It has a mild antibiotic effect in the small intestine. It is an excellent treat for chins, it is slightly sweet and delicious. It is a great herbal treat for all chins. 1/8 to 1/4 a teaspoon one to two times a day for use as a supplement, 1/4 teaspoon each day at most when using as a treat.